Tunxi Lodge preserves the indigenous Huizhou architectural style. Its white walls, black-tiled roofs with horse-head eaves and traditional carvings blend in the simple yet clean décor, allowing you to have a real touch of the local history and lifestyle. 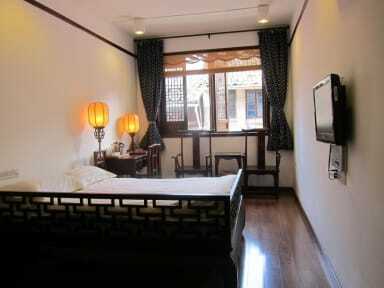 Tunxi Lodge’s classical environment and friendly service will enlighten your trip to Huangshan. Whether you are enjoying a cup of coffee at the Café & Bar in Tunxi Lodge or strolling along the Tunxi Old Street, you will be pampered by the historical and cozy ambience of this charming ancient town. 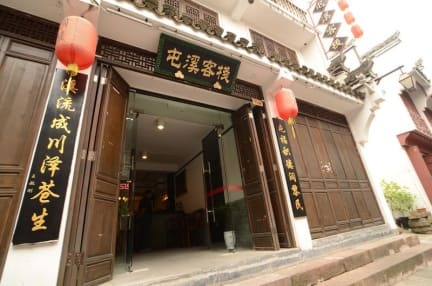 Located in Huang Shan's Tunxi district, the Tunxi Lodge (Tunxi Kezhan) sits at the front entrance of Tunxi Old Street, a stone-paved pedestrian street bustling with shops and restaurants occupying restored buildings done in the region's traditional 'Huizhou' style. The hotel itself occupies one such building and is decorated accordingly with traditional wooden furniture and decor as well as all the standard modern amenities. 1. All rates are in Chinese Yuan (CNY) (also known as Renminbi, RMB). 2. The rates are inclusive of one or two breakfasts, service charge & tax. 3. Children under the age of 12 live with their parents in a room without beds, without any additional charges. 4. Rates apply on a per room basis - single or double occupancy. 5. Check in time is 14:00. 6. Check out time is 12:00. 7. For Late check-out till 6 p.m., 50% of the room rate will be charged. After 6 p.m., full day room rate will apply. At least 72 hours in advance notice for free cancellation. Late cancellation or no show will occur the penalty charge for the first night. 8. The hotel accepts major credit cards including Visa and Master.